I bet everyone of us, especially girls has heard about a saying in chinese "一白遮三丑", which mean fair skin tend to cover up a hundred flaws. It used to describe a woman who is always considered to be beautiful as long as she is fair regardless on any other facial flaws. Beside developing a habit of putting on sun screen daily, a proper skincare regime is essential too. Here's my secret to bright fair skin and yes! Good things come in three! 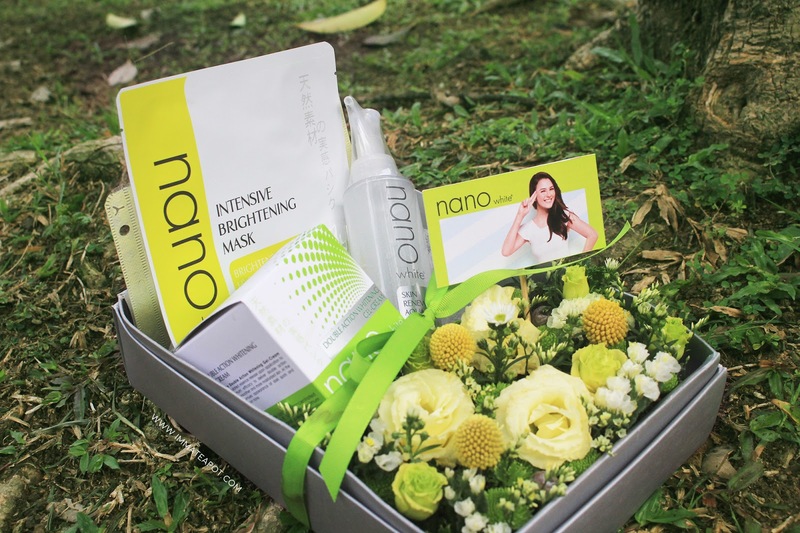 In this post, I am going to share about these triple treats from Nanowhite that helps keeping my skin fair, smooth and glowy. These range of products are packed with a 'Nano Skin-happy' technology that helps open up our pores for better absorption, where the nano molecules are 1000 times finer for deeper penetration to the skin, allowing the instant penetration of Omega White-C, effectively being absorbed and lighten the skin quickly! Let's get started with the 3 wonder steps and get into the products one by one! 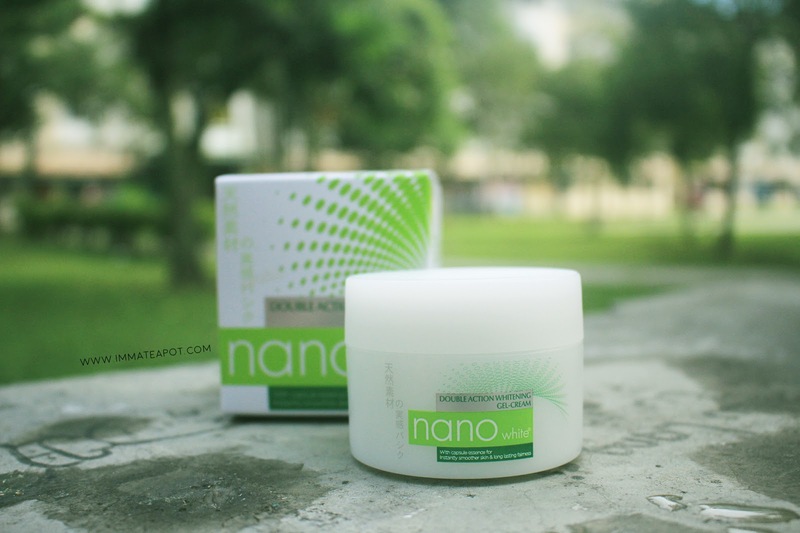 First of all, be sure to exfoliate our skin weekly with NanoWhite Skin Renewing Aqua Gel. It helps to remove blackheads and dead skin cells on our skin, keeping our skin fresh and silky smooth. 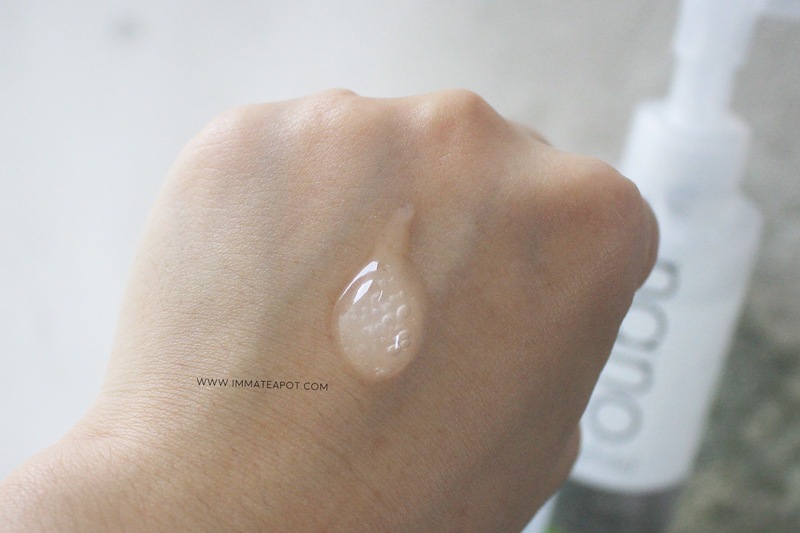 The NanoWhite Skin Renewing Aqua Gel comes in a transparent gel texture, which is much dilute and comes with no scent, as it is free from alcohol, coloring and fragrance. Pump a tiny amount of the gel on fingertips and gently massage it on your skin in circular motions. Personally, I would prefer exfoliating gel over any exfoliating scrub that contains granules, as the gel type is much more gentle and non-abrasive to the skin. During the massage moment, there isn't any pain or inflammation feeling on my skin. 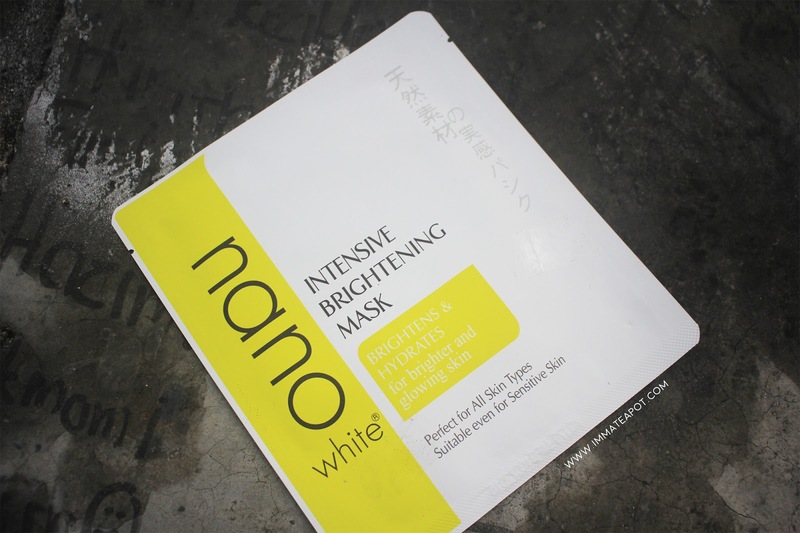 The next step will be treating our skin with NanoWhite Intensive Brightening Mask. Enriched with Grapefruits extract and Sodium Hyaluronate, it helps provide our skin with a boost of moisture and illumination. Apply the mask on face and chill for a good 15 minutes. It comes with a refreshing scent which is kinda similar to those citrus fruits. Unlike the previous whitening mask that I have used, this mask doesn't cause any inflammation feeling to my skin. Instead, I feel my skin is instant hydrated as well as brighter! As a final touch, do apply NanoWhite Double Action Whitening Gel-Cream that helps in ensure the maximum efficacy of delivery of doubled whitening effect, while keeping the skin moisture and smooth. At the same time, minimize the appearance of dark spots. The Double Action Whitening Gel-Cream comes in a gel, creamy texture, which is much concentrated and heavy. It contains unique capsules which consists of Vitamin E and C to helps maximizing the brightening effect and combat against oxidation. Even though the texture is creamy and concentrate, surprisingly it penetrates into the skin swiftly, leaving the skin with dewy glow finish. During the first application, there is slight needle-like pain on the face. I wonder if my skin is real dry/sensitive or any other reasons. But there's no more pain sensation feeling after the second application. I guess the before and after pictures said it all. 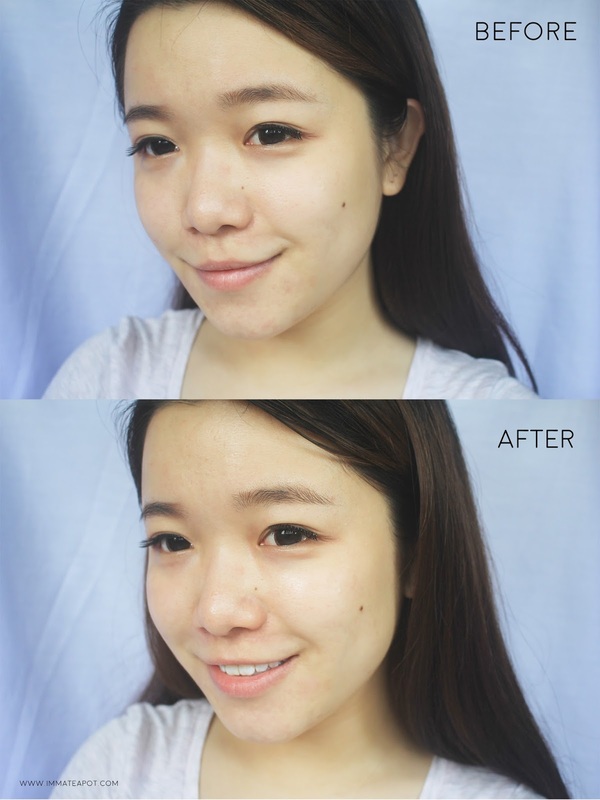 My skin turns so much fairer, brighter and glowy after using the products! I really need these range of products badly after my trip to Pantai Klebang, Melacca LOL I turned so much tan! I must tell that most of the whitening products tend to be drying, however these Nanowhite range doesn't, it helps boosting the skin moisture! Yet, there is some cons after using the products, where the skin turns slightly greasy after hours. That's all for the triple treats! For more information, please feel free to visit NanoWhite on Facebook http://www.facebook.com/nanowhite. I wanted Tanned skin before as I find it healthy. But now I feel fair skin actually look more attractive. This product looks good. Will try if have chance. I was out shopping just now and actually contemplated buying this set. I didn't and now that I have read your review, will go back tomorrow to get it!! Your skin looks more glowy after using them....and the price range is really good too! Wow...you look fair after applied this Nano white!! 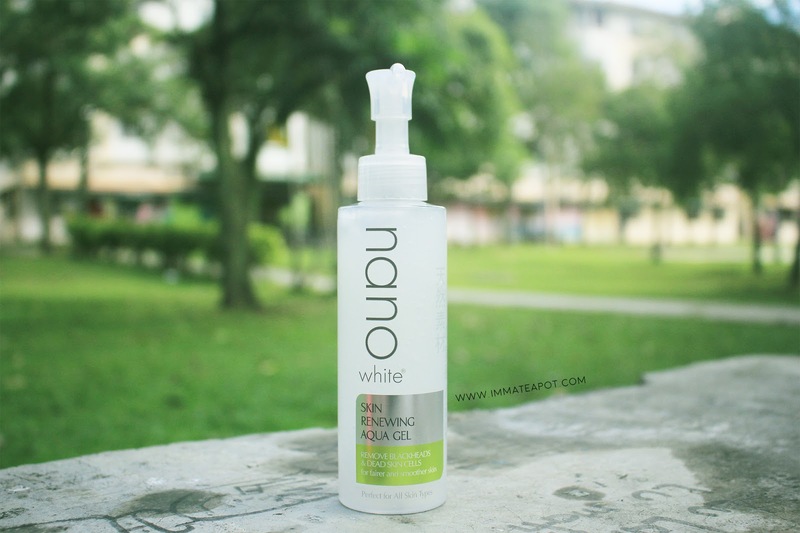 I want to try it out..
Nice range from Nano white. Look like this works! i could see the effect. that is remarkable! The products are nice. and they are very affordable! Wow~ I want fair skin like you!! Will check this out.